Hello friends, At present time most of the mobile manufacturer companies launch budgeted smartphone which comes with different great features and latest technology. 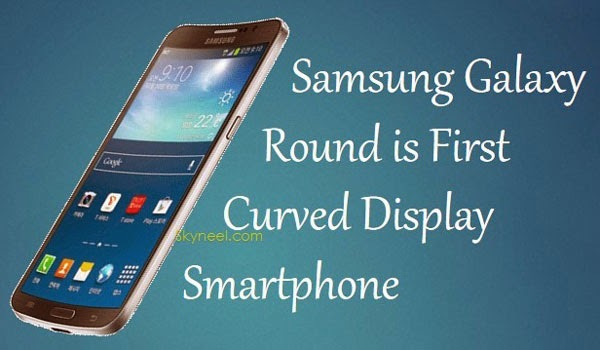 Now, today we have to discuss about the latest technology smartphone which is developed and launched by the Samsung company with the name of Samsung Galaxy Round phablet, This is the world’s first curved display Smartphone. The Galaxy Round features a Super AMOLED flexible Full HD 1080p 5.7 inch display. Samsung Galaxy Round is 7.9mm thick and weighs 154g. Samsung Galaxy Round has Quad-core 2.3 GHz Krait 400 processor (MSM8974), 3GB of RAM, 32GB of internal storage, 13MP rear-facing camera with autofocus and flash, 2MP front-facing camera, 802.11ac Wi-Fi, Bluetooth 4.0, USB 3.0 support, 2,800mAh battery, and Android 4.3 Jelly Bean. It is very slim and stylish smartphone which comes with great features. Samsung G910S Galaxy Round Powered by Quad-Core 2.3GHz processor. It has Qualcomm Snapdragon 800 chipset. It has 3GB RAM With 32GB or 64GB Internal Storage. Samsung G910S Galaxy Round comes with 5.7 inch Super Flexible AMOLED capacitive touch screen with resolution 1080 x 1920 pixels . It has 13MP Rear Camera with resolution 4128×3096 pixels and 2MP Front Facing camera. Galaxy S3 Slim is a very stylish Smartphone. Samsung G910S Galaxy Round runs on 4.3 android Jelly Bean. The Smartphone has a compass, Accelerometer, proximity and Maps, Calendar, Google Search, Gmail, YouTube, Google Talk, Alarm, Calculator, Clock, and other Google sync apps. This is power pack with loaded lots of features and apps. Samsung G910S Galaxy Round support 2G 3G and 4G network and both SIM card slot support GSM SIM. S Duos has Wi-Fi, Bluetooth, GPRS and EGPRS or EDGE, with 2100mAh Li-ion battery. 1. Galaxy Round has good processor and Ram. 4. Good Camera and Battery. 5. It comes with 4G Mobile Network. 1. We miss KitKat in this phone.